Mobile phone operator Vodafone has launched what it says is the "lowest-cost mobile phone on Earth". The Vodafone 150, unveiled at the Mobile World Congress in Barcelona, will sell for "below $15" (£10) and is aimed at the developing world. It will initially be launched in India, Turkey and eight African countries including Lesotho, Kenya and Ghana. The UN predicts that mobile ownership will reach 5bn in 2010, with most growth in the developing world. The International Telecommunications Union (ITU) said that demand was being driven by people using their phones to access banking and mobile health services. "Even the simplest, low-end mobile phone can do so much to improve healthcare in the developing world," said ITU secretary general Dr Hamadoun Toure. Has your phone changed your life? For example, he said, SMS can be used to "deliver instructions on when and how to take complex medication such as anti-retrovirals or vaccines". "It's such a simple thing to do, and yet it saves millions of dollars," he said. Mobile phones have also become an increasingly popular way to transfer and save money in the developing world. 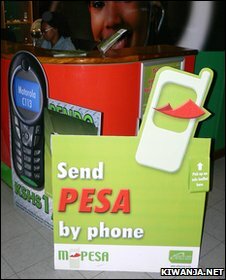 For example, a system known as M-Pesa in Kenya, which allows people to transfer money, now has around six million customers. Vodafone estimates that there are more than 11 million customers using banking services on its networks. The Vodafone 150 is designed to bring these services to more people, the firm said. The handset allows voice calls, SMS and has built-in support for mobile payment services. A more expensive version - known as the Vodafone 250 - also has a colour screen and an FM radio, and will sell for $20. Ken Banks, founder of Frontline SMS and an expert in mobile phone use in the developing world said the $15 price tag "lowers the bar, but not by a huge amount". "I bought a HTC mobile in Uganda two years ago for just over $20 equivalent, so depending on how you play exchange rates this isn't hugely different price wise," he told BBC News. "The price has come down but in terms of features [cheap phones have] remained largely static with poor memory, monochrome screens, no browser, and so on. "The trick is to reduce the price and increase functionality, and few manufacturers have managed to crack this to any real extent," he told BBC News. Are you in Africa? How has your mobile phone changed your life? What would life be like without it? Send us your stories and pictures. Email your pictures to yourpics@bbc.co.uk, text them to +44 7725 100 100, or you can upload your pictures here.